R&D Engineer at AnyBody Technology. 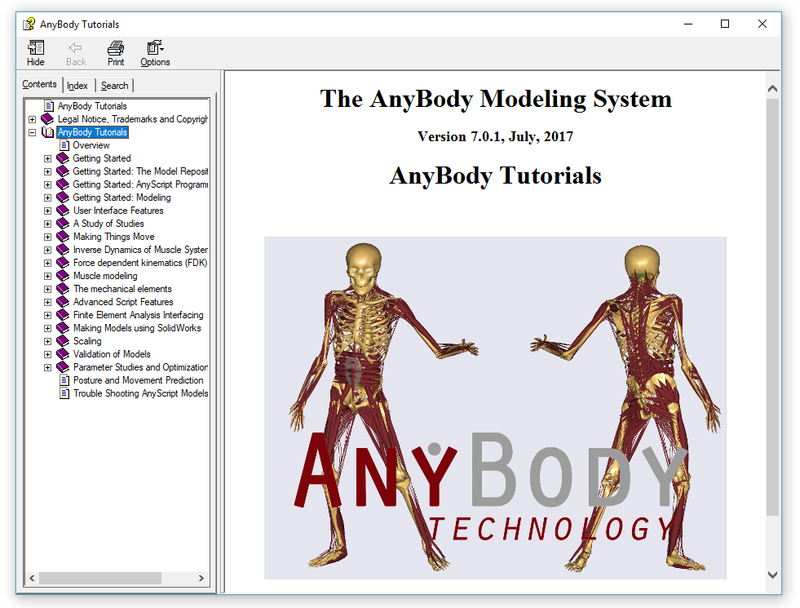 Join us for the launch of version 7.1 of our musculoskeletal simulation software - The AnyBody Modeling System, and a new version of the AnyBody Model repository (AMMR 2.0). In this webcast, Morten Enemark Lund, R&D Engineer at AnyBody Technology, will the new software features and the exciting new model repository which is shipped with version 7.1. Numerous updates to body models and example applications. With the release of the AnyBody Modeling System 7.1 update, we thought it was time to make a post about all the improvements in the new model repository. The AnyBody Managed Model Repository (AMMR) version 2.0 marks the culmination of a huge task to update our existing models and adding new models and examples. Of course we are not done. There are new model developments in the pipeline, and some of the improvements to the structure of the lower extremity model we would also like to do for the upper body. The tutorials used to live as compiled HTML (CHM), a binary format for a documentation system called Microsoft HTML Help. You find this kind of help resources in many older Windows Programmers. Today it may look old fashioned, but it was the best choice for distributing documentation in 2003 when the first version of AnyBody emerged. Microsoft has since discontinued the HTML Help system. Today there are much better options for software documentation which makes it easier to both use the tutorials and maintain them. Sphinx is a tool for generating software documentation. The Python community originally developed it for creating the documentation for the Python programming language. Today it is widely used in many different domains. The Linux community recently (2016) chose Sphinx as the new documentation system for the Linux kernel. Sphinx is well maintained and actively developed, and very easy to use. Sphinx converts reStructuredText files into HTML, pdf, epub or other formats. reStructuredText is simply plain text files with extra simple markup to define headers and other types of formatting. Results with 5 order Polynomial muscle criterion. Having the tutorials as plain text, may at first seem like a disadvantage. The AnyBody tutorials are currently stored as Word documents. But reStructuredText has many advantages as well. Finally, MS Word can still be used when writing new tutorials. The *.docx file can be converted into reStructured text using the Pandoc document converter. Pandoc can convert tables, any formatting, embedded images into reStructuredText. Pandoc even converts equations from MS Word into Latex style formulas which work in reStructuredText files. The new source files for tutorials are hosted on the AnyBody Github account togehter with the build HTML files. Contributions are always welcome! So if you find typos, missing links or anything else help us fix it. It is easy. Just fork the repository on GitHub, make the changes, and issue a pull request. See status of the Travis CI build: . Once a change is accepted and merged into the repository the script also automatically deploys the tutorial web page. This introduces a python application to help configure your model. We have just launched a new forum site for the AnyScript community. 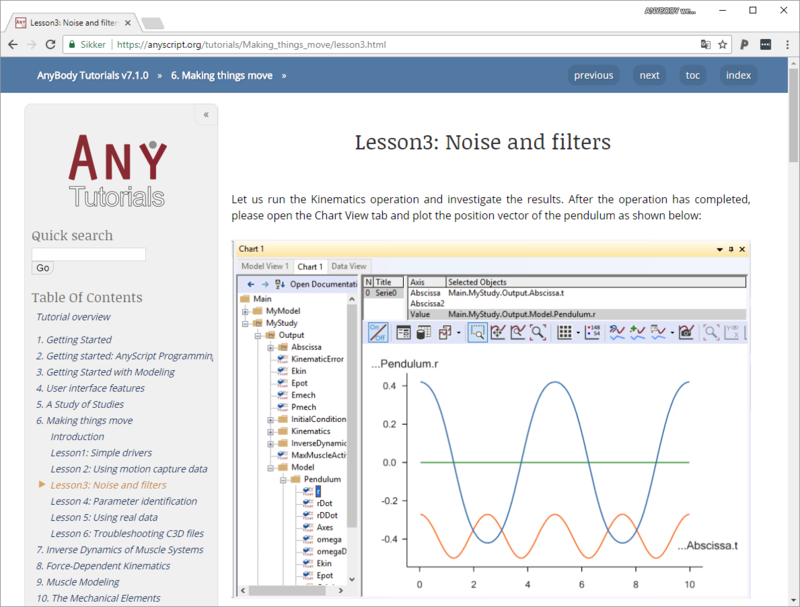 The ability to create and run mathematical optimization problems, using third party software is a valuable tool. Knowing the maximum strength of a model is valuable information. In this post we show how this can be calculated easily. © 2019 AnyBody Technology A/S. Powered by Jekyll & Minimal Mistakes.